I lost count of the number of failed attempts trying to get a native speaker to tell me the name of the symbol above when I first started learning Japanese. For most Japanese learners, it is commonly encountered when reading Japanese texts (even modern ones). This symbol (々) is technically known as the 同の字点 (dou-no-jiten), or the kanji iteration mark in English. Until recently, I still had trouble trying to enter it on my phone (without cheating), so I decided to do some research. And this article is the result. In the first set of examples, the kanji iteration mark does something rather interesting. For a language that seldom distinguishes between singularity and plurality, the “noma” mark comes in handy for emphasizing plurality. It also has other official and non-official names such as 漢字返し (kanji-gaeshi) or even 字送り (ji-okuri), the latter being a book title even! It is even a book title! 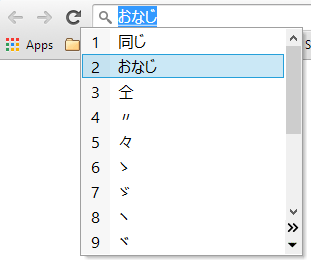 For me, 「おなじ」,「くりかえし」and「どう」worked on my desktop but only 「どう」worked on my cell phone’s default input software. 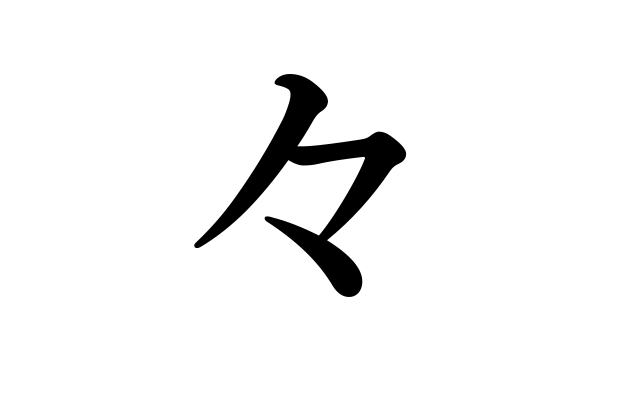 Historically speaking, the 「々」mark originated from Chinese writing (like all other kanji). Coupled with the fact that it is always found alongside kanji characters, one can be forgiven for mistaking it to be a proper kanji character. However, in the modern interpretation, it is classified as a 繰り返し記号 (kuri-kaeshi-kigou) or a recursive symbol. This means that it is related to punctuation marks such as 「。」and「、」more than anything else. While you will not find it as an entry in a kanji dictionary, you may an explanation of it under the 「踊り字」 (odori-ji) entry. 「踊り字」being the family of recursive symbols. Bearing in mind the rule of repeating only discrete words, in the case of 「民主主義」(minshu-shugi – democracy), 民主 is a single discrete word and thus it does not make sense to put a 「々」 in place of the second 「主」. HOWEVER, during occasions such as weddings and funerals, writing two kanji characters in succession may be considered inauspicious as it suggests a repetition of the specific occasion. For example, instead of writing 「結婚式式場」 (kekkon-shiki-shiki-ba) in full (which hints at a possibility remarriage), 「結婚々式場」 may be written instead. The same goes for 「告別式々場」(koku-betsu-shiki-shiki-ba) – no one wants to repeat a funeral service. While not as common as the「の」possessive marker, the 「々」iteration mark is also known to be used alongside Chinese writing (unofficially). A signage in Taiwan written in Chinese but with the use of the 々 to repeat the 謝 character. In Mandarin Chinese, 謝謝 means “Thank you”.